go to hell Rupert Murdoch! The following is reprinted in full from Craig Murray’s excellent blog. His post was originally entitled “Murdoch is Even Viler than We Knew”. This article was published on the Sun’s website at 2.50am, that is hours after the Manchester bombing. It was updated at 09.50am, long after the decision to suspend electioneering. I am not going to link to the article, but the comments below it from the public are unanimous. I pray that the vile people at the Sun have miscalculated, and in future the Sun will be as welcome in Manchester as in Liverpool. Did you see an interview broadcast on Sky News on Sunday night? Halfway through and completely out of the blue, the interviewer [Sophy Ridge] raised some spurious issue about an article published decades earlier in a Labour magazine which she says wasn’t sufficiently condemnatory of the IRA. Furthering the accusation, she then stated that Corbyn was an editor of the magazine – a claim he immediately dismissed, having first expressed his own disapproval toward the quoted article. Then for over 5 mins the interviewer repeatedly insinuated that Corbyn had been in league with the IRA. The timing of all this is deeply troubling. Thanks Craig, for some very prompt and thoughtful analysis on this dreadful atrocity. A few hours ago I picked up a somewhat blunt pencil at a polling station in the constituency of Sheffield Central and cast my vote. Around the country an estimated 30 million other people will have done likewise by the time the polling stations close at 10 pm. Following which, we must wait, expectantly. It is too late for persuasion and so this article is purely for the record – I meant to post sooner but simply couldn’t finish it (not satisfactorily — and though it needs further polishing I’m out of time, sorry). Yet the message I have been wishing to convey is a comparatively simple one. That whatever else happens, the Tories and their Lib Dem lackeys must be defeated. Image and text taken from one of a sequence of excellent articles written by John Lanchester and published by the London Review of Books. Five years ago, as the last dregs of the constituency results trickled in at about 4 o’clock, it became clear that there would be no overall victory in the General Election. Instead we had drifted to a stalemate: a hung parliament. And given how our peculiar (and extremely unfair) FPTP system habitually returns majority governments, this state of post-electoral limbo was difficult to grasp, especially as we crawled off late to bed. Next day there was an almost palpable sense that something important had been left undone. Electorus interuptus. So began an effusive Guardian editorial, and not since David Steele instructed his party members to “go back to your constituencies and prepare for government”, had centrist hyperbole touched such feverish levels. That in-your-face mantra “get used to it” repeated maniacally at the beginning of every paragraph, and all under a banner that read like a flaccid, if truculent, Lib Dem cry for electoral justice: “Labour would come third by popular vote yet still have the most seats – such a result would plunge British democracy into crisis”. As it transpired, of course, the Tories ultimately prevailed instead, limping into office on the arm of Nick Clegg’s hasty acquiescence, and in spite of the fact that the Lib Dems had actually polled rather disappointingly – as usual. You may recall too that five years ago the party still had their unique selling point – that long-held and dependable commitment to overhaul our unfair FPTP system and replace it with PR (much more to their own liking). But this didn’t happen. Even as the Lib Dems hitched their own ride into office on the back of the Tory’s miserable failure (a decade in opposition, yet unable to defeat one of the least popular governments in modern history), the Lib Dem leadership still didn’t manage to negotiate a referendum on PR… let alone actually get PR! Nothing monumental occurred in Election 2010. Labour didn’t come third whether by number of seats or in proportion of outright votes. Quite contrary to the Guardian’s excitable speculation, our democracy was no more “in crisis” post-election than before. Election 2015 is different. This time around a hung parliament is anticipated and there has been almost non-stop speculation on the eventual makeup of our next coalition. In fact, since the campaign proper started, the media have been collectively hung up on hung parliament. So can we trace the roots of this monomania? [But] by and large, Lord Aschcroft’s increasing influence over British politics has passed unchallenged. And that’s strange, for a number of reasons. Firstly it’s strange because there are legitimate questions to be asked about the accuracy and reliability of what have euphemistically become termed “The Ashcroft Polls”. As I say, there was a lot of comment over the weekend about the new Sheffield Hallam poll. But it wasn’t new. It was first published back in November, and at that time showed Nick Clegg 3 points ahead. That week, Antony Wells of Yougov identified errors in the published data, leading Lord Ashcroft to revise Clegg’s lead down to three points behind. Lord Ashcroft then reviewed two other polls, one for Thanet South and another for Doncaster North. A published lead of 5 points for the Conservatives in Thanet should in fact have been 1 point. A published 29 point lead for Labour in Doncaster should in fact have been 30 points. What does Lord Ashcroft want? Not a quiet life, certainly. Last week saw him again setting the political agenda, with a raft of constituency polling in Scotland showing Labour heading for electoral annihilation and the SNP poised to emerge as kingmakers after the poll. Or maybe this “something” Ashcroft wants is connected to his longstanding association with the Conservative Party… who knows, hey? Let us cast our minds back again, to recall how a majority of voices in the media had been quite insistent that the country was heading for ‘another’ Tory victory – I put ‘another’ in inverted commas because although it was routinely presented as something of a repeat performance, little mention was made of the rather awkward fact that the Tories don’t in fact enjoy a majority, having failed to hold one since the heady days of John Major’s government. Nevertheless, twelve months ago the mainstream was chock-full with opinion that the Tories were all-but home and dry in the forthcoming General Election, until that is, out of a less than clear blue sky, there were UKIP successes first in the council elections and then more spectacularly in the Euro-elections. This dent to Tory morale was swiftly followed up with the Tory to UKIP defections of Douglas Carswell and Mark Reckless, and consequently, an already precarious Tory minority was suddenly a lot more wobbly. Like an oil tanker changing course, the media apparatus corrected its position, a little. Given that a Tory majority was no longer such a nailed-on certainty, they concluded in unison, we could, in all likelihood, expect a hung parliament. It is this prospect of another hung parliament that the media has latched on to ever since, as if majority governments per se have become an endangered species. Indeed, “rainbow coalition” has since become the media’s main infatuation, endlessly touted, not merely as inevitable, but as vital to ensuring some renewed vigour in our clapped-out political system. Politics, the media commentators have been routinely informing us, is so completely transformed from five years ago, that (to steal from the Guardian editorial again) we’d better get used to it. To a political landscape that is more “diffuse”, more dynamic, and just more damned interesting (apparently)! We have seldom witnessed such certainty about uncertainty. Since the election officially kicked off (what feels like a lifetime ago) all of our TV channels have thus been emblazoned with multicoloured logos. Of course, the media enjoys offering its audience the perception of a broader variety of choices. Variety generates interest, which in turn sells election coverage. So writes Gerry Hassan, Research Fellow in cultural policy at the University of the West of Scotland – but I’ll come back his article later. Now, when I came across this many weeks ago, I thought it sounded far-fetched enough to need supporting. So I had intended to frame it in such a way as to gently convince the skeptical reader. For instance, I had decided to refer back to BBC’s weekly political panel show, Question Time, when on April 2nd, journalist Peter Hitchens raised the issue of what he saw as “an unholy alliance” forming between Conservatives and SNP. Hitchens was the first political commentator to draw mainstream attention to the strategy. And why, I then wondered, was Chief Tory Whip, Michael Gove (on the same outing of QT) also gushing with enthusiasm and praise for SNP leader Nicola Sturgeon’s performance during that same night’s “seven leaders debate” (on ITV immediately prior to QT). What had brought the Tory bigwig Gove to be waxing altogether lyrical about the remarkable talents of (presuming we accept the hype) such a progressive radical as Sturgeon? Furthermore, it wasn’t just Gove who had been wooed over by SNP leader Sturgeon. A fortnight later, on the QT broadcast immediately following the five leaders debate on BBC1 (a debate which both Cameron and Clegg declined invitations to join, preferring to keep their heads down), it was Conservative Party Chairman, Grant Shapps, who was overeager in his praise Sturgeon’s follow-up performance, saying he thought “frankly she ran rings around Ed Miliband”. “What I find puzzling now is the prime minister’s position that the SNP is far worse than Labour because, if so, as there are not many seats in Scotland where the Conservative Party has a chance to win, the logic would seem to be that Conservatives should vote tactically for Labour as the lesser of two evils. “I think it’s a huge scare tactic against Labour and whether the particular seat in the House of Commons is occupied by a Labour member or an SNP member perhaps it’s not a great difference. In notable contrast to the aloofness which characterises how Westminster MP’s now deal with Murdoch and News UK, Salmond is still (even in this post-Leveson and phone-hacking environment) ready to admit to affection for the media magnate – who had a Scottish grandfather. Salmond's private polls predict 54-46 Yes. Desperate last ten days ahead for both sides. Most powerful media, BBC, totally biased for No. 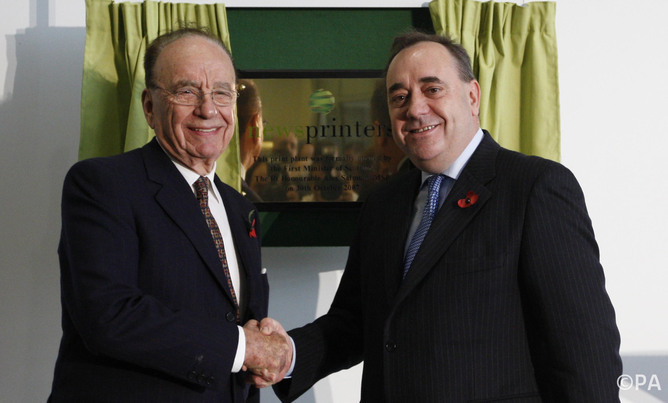 We know from the Leveson Inquiry and subsequent admissions that Salmond planned to lobby the UK government on Murdoch’s behalf in News Corporation’s bid to take over BskyB completely in 2010. Rumour had it at the time, in speculation fuelled by former Murdoch acolytes Andrew Neil and Kelvin Mackenzie, that Murdoch was prepared to move BskyB to Scotland in the event of independence. Click here to read the full article at The Conversation. I do agree with Murdoch on one point here – perhaps the only point we could ever possibly agree on – which is how the BBC is “totally biased”. But then, no matter how hard ‘Aunty’ tries to pretend otherwise, she is, and always has been, a willing arm of the British establishment. Come the independence referendum, and given the first B in BBC, it would be astonishing if they had been otherwise; any break-up of the Union immediately prompting the likely break-up of the corporation itself. Turkeys and Christmas, anyone? Strange hey. 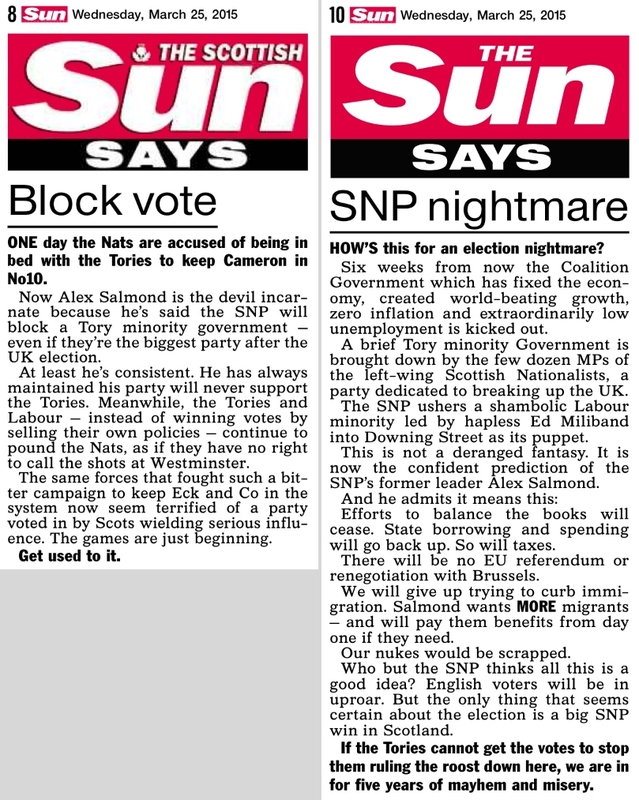 How The Scottish Sun is backing “the Nats” as the gallant underdogs, whilst simultaneously The Sun (its sister tabloid in England) talks up our wonderful Tory government and frets about how it might be “brought down by the few dozen MPs of the left-wing [a swearword in The Sun] Scottish Nationalists” who will usher into power their “puppet” Ed Miliband. Now this really is balance – isn’t it? This pincer attack is the same Tory strategy again, of course. The singular intention to reduce the Labour share of the vote with both editorials effectively saying (in differing ways) that SNP stand on the verge of a landslide victory. North of the border this message continues: “Get used to it” (where have we heard that before? ); whereas the southern edition scaremongers that “If the Tories cannot get the votes to stop them [meaning SNP] ruling the roost down here, we are in for five years of mayhem and misery”. Which UK party do the Scottish Nationalists most want to do well in the coming election? Might they prefer the Tories? And might the Tories, deep down, also prefer a Scottish exit from the UK to the continuing Union they claim to support? Is this the love that dare not speak its name? The Tory party’s best hope of a getting a Westminster majority again is to get rid of Scotland. A UK shorn of Scotland would produce a Tory majority Parliament and so at least temporarily halt the slow but accelerating death of the Tory Party. But time is short. The core Tory vote is (literally) dying in droves as it is composed almost entirely of older voters. It is not being replaced. And as the new mass migrants become UK citizens, they are unlikely to become Tory voters. The break must happen soon if the Tory party is to regain its lost ability to govern with an absolute majority, and all the fundraising and other advantages that come with that status. It is curious that, for different but clearly interconnected reasons, there has been a surge in the support of not one, but two nationalist parties. Nationalists with diametrically opposing outlooks. Yes, UKIP and the SNP are exceedingly strange adversaries. So let us briefly turn from the SNP to consider their grotesque ugly sister nemesis, UKIP. Even Farage’s poisonous alarmism about an insidious invasion by Bulgarian migrants is rooted in a more justifiable concern. For why have consecutive British governments dropped our nation’s border controls with countries significantly more economically deprived than we are? This policy was bound to lead to increased downward pressure on pay and conditions for workers at home, whilst boosting the profits of the exploitative bosses and gangmasters. But none of this is anywhere near to the top of UKIP’s true concerns. Immigrants are the scapegoats, and this anti-Europe line is UKIP’s preferred wrapper, just as the Union Jack is its other wrapper. No amount of make-up can disguise UKIP’s frothing at the mouth. On the one hand, Ukippers claim to be libertarians, which in Britain translates more than loosely as Thatcherite – free market and pro-austerity – whilst, on the other, they feign to be radicals when are very evidently reactionaries, and thus more Thatcherite still – a mix of Alf Garnetts and Colonel Blimps (more often Major Blimps and Captain Blimps). Little Englanders who simply can’t abide Johnny Foreigner. Which is why UKIP appeals mainly to those who would love to be able to vote for Thatcher, if only she wasn’t quite so dead… and why they offer very little in the way of true opposition to Labour. Instead, the serious threat to Labour’s vote is decidedly north of the border. UKIP, meantime, pose a genuine threat to the Tory’s share of the vote – and in splitting the traditional Tory vote, I personally wish them every success! The big thing that connects the rise of UKIP with the rise of the SNP is that many who have traditionally voted either Labour or Conservative are likewise desperate for real change. In offering themselves up as alternatives, UKIP and SNP are trying to pool support from disaffected voters with drastically alternative outlooks. But beware: all nationalism feeds upon division. There was a time, not so long ago, when SNP were shunned by those on the left (as nationalists customarily are) and disparaged for being “Tories in tartan”. But the great wonder of nationalism is that by tying oneself to a flag rather than being anchored to a secure political creed, one is able to flutter freely and change direction at a whim. A quick overhaul of political livery and the flag is still billowing beautifully. Thus the SNP, on seeing how the wind had turned, adroitly put on the guise of an anti-austerity party. Tartan Tories no longer, but relaunched as McSyriza. Now, if we ask Nicola Sturgeon whether she and her party are in favour of the so-called “free trade agreement” she will reply that she is, although with reservations. She will point out the need for ‘robust’ negotiations ensuring exclusions for the NHS. Ed Miliband will say almost precisely the same thing, if similarly pressed. Alternatively, if you ask Nigel Farage this question, keeping in mind that we are talking about a clandestine EU treaty that will effectively mark the beginning of the end to the very existence of the nation state, rather than challenging it, he instead recommends the UK negotiate our own (secret) free trade deals with America, but in half the time it takes to cut through all of the red tape from Brussels. Beneath this the differences between Labour and SNP are less than first appear, but magnified by language, tribalism and intense electoral competition. So, when it comes to which of the two is the more radical (a tallest dwarf contest if ever there was one) it is all in the eye of the beholder, whilst what actually encourages some Scottish voters to discriminate for and against goes back to the positions each assumed during the independence referendum: Labour penalised for its partnership with the Tories (as if it really had a choice given the circumstances) in the “Better Together” campaign. A friend said to me recently, that if we don’t trust the polls, then what do we have to go on? Not much. Mostly, we have those election results in the European, council and bi-elections, all of which came as bad news for anyone hoping to see the return of a Tory government (coalition or otherwise). So the post-referendum rise of the SNP has been a tremendous boon to flagging Tory morale. But what are we to make of the media’s role in other ways? Is any of this reminiscent of another of today’s leading political figures? Understood properly, what the media are reminding us here is how the New Labour baton was supposed to have been passed to elder brother David, the designated and rightful heir to the kingdom of Tony Blair. However, Ed somehow got in the way… whatever happened to primogeniture? Neither the establishment, nor the media that speaks for it, have forgiven such impropriety. Cameron's Tories bash vulnerable Miliband for months with no effect on polls. Need new aspirational policies to have any hope of winning. 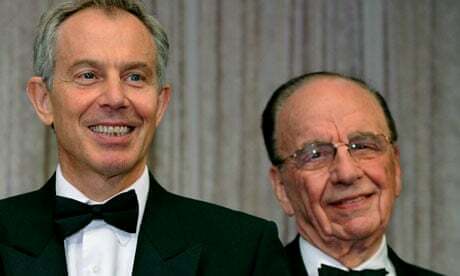 It is understood that Mr Murdoch reminded executives that Labour would try to break up News UK, which owns The Sun, The Times and The Sunday Times. The party has suggested that no owner should be allowed to control more than 34 per cent of the UK media, a cap which would force News UK to sell one of the titles. Miliband is weak? Well, not if he really does stand up to Murdoch and News Corp. In any case, as Murdoch unhappily concedes, the Tory strategy of playing the man instead of the ball has largely failed. Two and a half years ago I personally heckled Ed Miliband during a speech he made at a rally in London. I make no apologies. After all, how dare anyone climb onto the stage of an anti-austerity protest and call for cuts. So it pains me to say that we must hope Miliband is our next PM. But Ed Miliband is not Tony Blair, and he has already shown backbone when it matters. When he held his ground and – along with the support of a number of Tory defectors (I like to give credit wherever it is due…), though no support from Lib Dems (…but not to forgive easily) – was able to defeat the government on a vote for war, something unheard of. The Nato attack against Syria was thwarted largely thanks to Miliband; winning a Commons’ vote that spared countless lives. 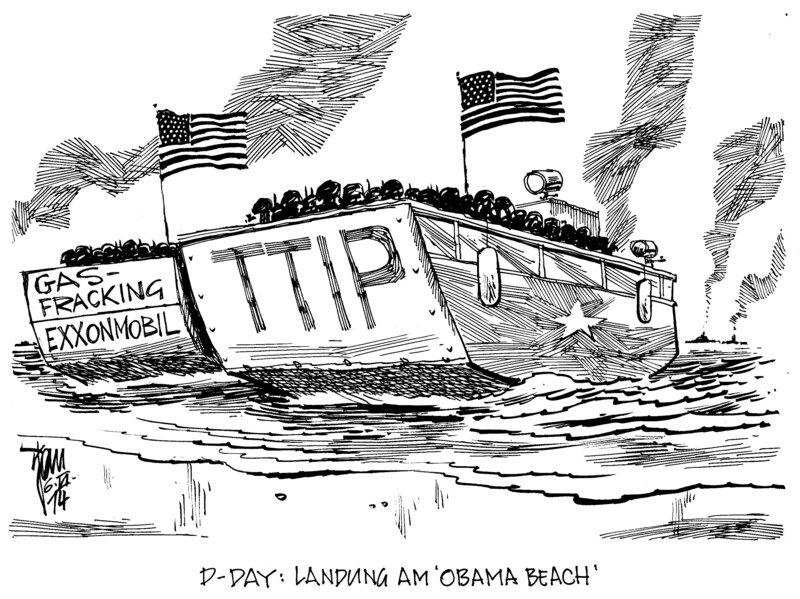 Of course, having opposed not only Obama, but the entire Anglo-American war party, he immediately took more flak. The “special relationship” was supposedly damaged beyond repair, the media bleated in unison in the weeks that followed. Warmongering gibberish peddled by a news media drunk on decades of senseless bloodletting. Our public services are close to breaking point (some will say already past it), so what if anything will survive another five years of Tory cuts? And harsher, deeper cuts, as they have kept on promising us. Meanwhile, how divided will the nation be once more wealth has been transferred from the destitute to the superrich, even as the national debt continues rising because of “austerity”. New Labour are very much responsible for this trend too, but in fairness to Ed Miliband, he was hardly central to their neo-liberal programme. I believe we should at least give him a chance (I never said the same for Tony Blair). My expectations of Labour remain low, but a change of political direction is as desperately as it is urgently required – and what begins as a small change might be accelerated as other nations such as Greece push the same demands. In the longer term, we can obviously do much better than New Labour, but just how “New” Labour is Ed Miliband? When asked why he voted against brother David, he replied that his own political outlook is radically different. I hope there is truth to this – although if Ed Miliband is elected into office, then we must be ready to hold his feet to the fire. I try to steer clear of making predictions on this blog (for obvious reasons) but I am about to make a slight exception… I believe that Labour can win this election, and that even an outright majority should not be ruled out of hand. After all, prior to the last election our FPTP system delivered majority governments time and again. Has politics really changed so much in just five years? Of course, it could be that the Tories get a majority instead, however, there are other reasons to believe that Labour are more likely to win. Threefold reasons and ones that have next to nothing to do with Ed Miliband himself. Thus the stage is set. UKIP poised to steal votes away from the Conservatives and hopefully to finally break the party in two. But, and this is the real sticking point, the SNP will undoubtedly grab votes from Labour. So the outcome is actually dependent upon the results of these two lesser battles: Conservative v. UKIP and Labour v. SNP. I appreciate that many in Scotland will be encouraged to vote SNP either to punish Labour or else in the hope of landing a better deal for Scotland – and why not be self-interested. But let’s face facts, SNP are not Syriza, nothing like them – and perhaps, as I suspect, more closely akin to the Lib Dems of five years ago. As one who fell for the Lib Dem scam, I feel obliged to (rather belatedly) caution you. Should the vote in Scotland go solidly the way of the SNP then it may pave the way for an unthinkable outcome – Conservatives failing to win a majority (as they likely will) yet winning most seats overall and somehow thereafter cobbling together a second Tory coalition. Can we even begin to imagine how ruined our nation (Scotland very much included) will be if there are five more years of rule by the Tories? I sincerely hope we are not about find out. The national debt figures are out – £1.2 trillion and rising – and although I hate to say it, the Labour Party has a valid point to make. If you don’t adjust for inflation, Osborne has borrowed more in under four years than the Labour Party borrowed over 13 years. When the Tories took office, total government debt was £811bn. On last week’s figures, it’s now £1,451bn – an 80pc rise in just five years, with a lot more to come. This national debt matters. It must be serviced with regular interest payments, diverting money from front-line public services. Even at rock-bottom interest rates, the Government spends as much on debt interest annually as on defence. As the national debt escalates, courtesy of £100bn-plus annual deficits, and as interest rates inevitably rise, we’ll soon be spending more on government debt service than on state education. I remain deeply concerned about our national debt, not only because of the absurdity of vast debt service payments, the damage to coming generations and the incentive politicians have to “inflate the debt away”. I also worry that our vast liabilities could ultimately spark another systemic meltdown, not least because such a high share of UK government debt is now owned by foreign creditors. And that makes our public finances extremely vulnerable if there’s a considerable weakening of the pound. This issue has been on my mind for a while, but recently crystallised while talking to friends at the Social Market Foundation (SMF) think-tank, where I’ve long served on the advisory board. As a result of quantitative easing, around a third of the UK’s gilt stock is owned by the Bank of England. That’s right, 32pc of our government bonds have been bought by our central bank, using virtually printed money. That’s helped to rig the market, keeping interest rates artificially low. The UK recently chalked up the largest external trade shortfall in our history, with our so-called current account deficit registering well over 5pc of GDP. While our imports have long outweighed our exports, our net income on overseas government investment and assets has recently swung from a surplus of 3pc of GDP to a deficit of over 2pc. The systemic failures which led to the banking crisis of 2008 have never been remedied and instead the can was kicked down the road. What Gordon Brown started, the Con-Dem coalition have simply continued, and as a consequence of complete lack of reregulation of the financial markets, we can expect that the next crisis, whenever it comes (and the can might yet be kicked a lot further) will be far bigger than the first. Meanwhile, as the debt burden mounts, there can be no significant economic recovery so long as further money is simply wasted on banker bailouts and debt repayments instead of being invested in infrastructure and services. “Austerity”, meaning cuts to all government spending aside from its debt repayments, is a form of wealth transfer from the poor to the rich. Ailing GDP figures just before the election were barely mentioned in the media, but easily-obtained statistics on productivity, trade, manufacturing and construction, are all bad and the Tories have missed their own target (whether wise or not) on deficit reduction. In any case, the Tory record on the economy is dreadful. A Tory Party really concerned about the loss of Scotland would have done as Norman Tebbit suggested, and urged its supporters to vote Labour to stop the SNP. Instead, to the dismay of elder statesmen and experts such as Michael Forsyth, it talked up the SNP, paying elaborate compliments to Nicola Sturgeon after the leaders’ debate (George Osborne and Michael Gove were observed doing this). To claim, while behaving in this fashion, that the Tory Party is a bulwark against the SNP and Labour is in their clutches is absurd. The SNP are delighted by the Tory victory, which makes it all but certain that they will get a repeat landslide in next year’s Scottish general election, with a manifesto commitment to a second referendum, which I think they will then win. Let us see how Mr Cameron now copes with the SNP’s sweeping victory, for which he must take so much of the blame. Click here to read Peter Hitchens’ full post-election article. Plans to redraw constituency boundaries before 2015, backed by the Tories, have been defeated in the House of Commons. MPs voted by 334 to 292 to accept changes made by peers, meaning the planned constituency shake-up will be postponed until 2018 at the earliest. It was the first time Lib Dem ministers have voted against their Conservative coalition colleagues in the Commons. The two parties have been in dispute since proposed elections to the House of Lords were dropped last year. Having somehow ended up on a Liberal Democrat email list, presumably because I accidentally voted for them on a couple of occasions, on Wednesday I received the following message from their respected leader, Nick Clegg. By way of personal response, and to address the various items point by point, I have decided to add my own reply to each paragraph. Today’s Queen’s Speech has again shown that the Liberal Democrats are punching way above their weight – and we can be proud of that. It included many of the long-term reforms we’ve campaigned for, such as reform of the banks. These will help build a sustainable future for our country. Reform of the banks. Yes, good idea. And you say you’ve campaigned for this already? Can’t say that I remember, but good luck with the new initiative. I trust that you will begin by pressing for a clampdown on the totally out of control financial derivatives market, and especially the sorts of “over the counter” derivatives that have enabled fraudulent practices to reach unprecedented levels. Since the cause of the crisis was the growth in such trading, and aside from bringing in regulation to stop future problems of this kind arising, I presume that you also intend to press for a full investigation of the banks responsible, with necessary powers granted to bring later prosecutions. Here’s a government petition that you might also like to sign. In 2010, we took the decision together to enter into a Coalition Government so we could do the right thing for the country at a time of economic crisis. Today we’ve focused on helping families and supporting growth and jobs. This is certainly the justification you’ve repeatedly given for tearing up the election manifesto and then signing up to a new manifesto that no-one actually voted for. I’m sure you did this with the best of intentions, and no doubt those at the top of the party know best. “Helping families and supporting growth and jobs” sounds very reasonable, if a little vague. It would be helpful here if you might give a few more concrete examples because mostly I’m just aware of your unflinching commitment to wholesale and damaging “austerity measures”, combined with the accelerated privatisation of the NHS and our other public services (including, perhaps most worryingly, the police force). Vince Cable will regulate the banks so they can no longer be in a position to hold the country to ransom when their financial gambles don’t pay off. And Ed Davey will establish the world’s first Green Investment Bank and introduce electricity market reform to protect consumers, support low-carbon energy and invest in renewables. It is pleasing to see that Vince Cable is now rehabilitated after being caught bad-mouthing the venerable Rupert Murdoch. I suppose that this is in part thanks to the Leveson Inquiry, which will presumably at some stage call your close friend David Cameron in for questioning. I trust that Vince Cable will now hasten to regulate the banks so that, as you put it, “they can no longer be in a position to hold the country to ransom.” My main concern here being that, and as you no doubt recall, Vince Cable has candidly admitted that he totally failed to see this present crisis coming, in which case, I fear that he may not be the best person to solve the crisis now. Hopefully, Vince will prove me wrong. Regarding green initiatives, here’s something else we can all support, and I take it that these new initiatives will have nothing to do with granting permission for widespread natural gas fracking under our beautiful countryside. In any case, I feel confident that your government would never sacrifice our country’s energy security for the sake of a few inadequate wind-farms, and that altogether more temperamental, although wonderfully green alternative, nuclear power. Incidentally, the simplest and most effective way to introduce electricity market reform would be to entirely renationalise the industry. Are you also thinking along these lines? We’re also helping some of the most vulnerable people in our society. Steve Webb will help pensioners by introducing a flat-rate pension. We’ll propose a way to modernise adult care and support, finally ensuring dignity in old age. Well, I’m sorry but I’m going to have to call you on this one. You say that you are “helping the most vulnerable people in our society.” To the untrained eye, however, it looks as if you are instead committed to slashing public services and to raising the pension age, which will automatically disqualify many vulnerable people from receiving the money that their National Insurance contributions had supposedly paid for. I must also confess that I have never heard of Steve Webb but hopefully he knows what he’s doing. Today also clearly set out our collective determination to reform the House of Lords, an historic commitment of our party. This one sounds like an excellent idea, at least in principle. The removal of an archaic and self-serving elite is something we can all get behind. And this was in the Queen’s speech… that’s right? The question remains, of course, how will we ever replace our lordships? An elected second chamber? I’m not sure if such a change would guarantee any significant improvement and offer up, as an example, the current failings of the American system. When both houses are elected this can lead to a situation in which all members are holding party political allegiances, and in any essentially two-party system (which as you know, Britain still remains), this has the unwanted effect of bringing the two houses into closer alignment, which is, often as not, to the detriment of the wider democratic process. However, since some kind of reform is unquestionably desirable, perhaps we might allow ourselves to think a little more outside of the box. Here then is a radical proposal of my own: perhaps the future members of a “House of Lords” might be decided not on an hereditary basis, but modernising the process, by means of a national lottery. After all, in our prospering casino economy, pure luck has become the preferred method of wealth distribution, so why not apply a similar system to apportioning a little more of the political power? More seriously, verdicts in our highest criminal courts are already reached by the agreement of twelve randomly selected members of the public, and not thankfully by panels of appointed judges. So why not take this same tried and tested formula to the next logical level? Britain would lead the world again. And with the House of Lords being thereby democratised in the fullest sense of the word, just imagine the renewed public interest in politics. We could even have regular votes on which lord to evict, say every six months or so, like on reality TV, but actually real, just imagine that… the viewing figures! Well anyway, just off on flights of fancy, sorry, I’ll cross that last bit out and get back to the more serious matter of replying to your letter – oh, and before I forget, “Dear Friend”, thanks buddy… the personal touch is so often missing in this non-stop, 24/7 age of cut-and-paste efficiency. There’s so much more I could highlight: Sarah Teather’s work on improving support for children with special educational needs, our support for flexible working and shared parental leave and our proposals to strengthen the hand of farmers and other suppliers of supermarkets through an independent adjudicator. This Queen’s Speech has a firm Liberal Democrat stamp on it, delivering on what we’ve passed at Conference and pounded the pavements and knocked on doors for. “This Queen’s Speech has a firm Liberal Democrat stamp on it”, you write, and I certainly was most pleased to see that the government seeking to reform this country’s overly stringent libel laws. For some reason, however, you have failed to mention this piece of good news in your letter. Whatever – I’m sure you won’t forget to pass the legislation. You have also failed to mention that at the same time, the government are pressing ahead with the Draft Communications Bill which according to BBC news: “Plans to make it easier for the police and intelligence agencies to monitor e-mails, phone calls and internet use…” Does this proposal also have the “firm Liberal Democrat stamp on it”? Now if I’m being perfectly straight with you, this Queen’s speech does leave the impression of a government intent on rather a lot of fiddling around – setting up new quangos here, there and everywhere – but then I suppose the public should be shouting a bit louder: “Fire, Fire!! !” Something like that. In any case, presumably Ma’am wasn’t handed the relevant pages wherein her government outlines its bolder plans to halt our never-ending slide into a surveillance society, and to restore just a semblance of social justice. Perhaps you mislaid them yourself, and forgot to mention all this in your letter. Anyway, chin up on those local election results, and keep the yellow flag flying high! Journalist Peter Oborne has been consistent in raising the alarm over the “dark arts” employed by the tabloid press to get their stories by any means. Here, he also looks into the world of the Rupert Murdoch and the influence and political power he has held in the UK. The incredible story of how Rupert Murdoch used celebrity scandal to bankroll his expanding media empire, before scandal ultimately engulfed the News of the World itself. Jacques Peretti talks to everyone from Hugh Grant to Murdoch insiders to find out how the world of celebrities, cops and politicians first cosied up with, and then turned against, the world’s most powerful media mogul. With News Corp still trying to seal the deal that will secure ownership of the remaining 60% of BSkyB that it doesn’t own already, effectively giving them monopoly control of satellite broadcasting in the UK, there was one important hurdle they needed to jump – Ofcom. Ofcom is the communications regulator. We regulate the TV and radio sectors, fixed line telecoms and mobiles, plus the airwaves over which wireless devices operate. Another cursory glance at Ofcom’s own website reveals that its Chairman, Colette Bowe, is a board member of Morgan Stanley International, a position that she took up in 2010, around the time when the BSkyB takeover was announced. Why is this relevant? Because Morgan Stanley have been directly involved as one of two companies providing BSkyB with advice about the proposed takeover. Further information on their involvement can be found here – see top of page 3. On November 4th 2010, Ofcom released a “Guidance note for public interest test” announcing the start of Ofcom’s investigation. Three weeks later, on November 25th 2010, Ofcom Chairman, Colette Bowe, joined the board of Morgan Stanley & Co. International plc. By the next day, Bowe was both in charge of Ofcom’s investigation into the BSkyB takeover whilst also now a Board Member on a company offering advice to BSkyB. No surprise then that Ofcom gave the merger the go-ahead. With the competition commission also having been bypassed, following Jeremy Hunt’s decision which allowed News Corp to speed up the process, the only remaining hurdle now is whether Ofcom decides to reverse its original decision. Speaking to BBC News today, Jeremy Hunt says he has decided to ask Ofcom if they would review their initial recommendations, in the light of the “horrific revelations” of last week. But with the Chairman of Ofcom, Colette Bowe, so clearly compromised by her dual roles, the question of Ofcom’s stated independence also needs to be considered. To see what Jeremy Hunt had to say, watch the video link here. To read more on the same story may I recommend a very insightful article posted on former British Ambassador to Uzbekistan Craig Murray’s own website. Reporter Vivian White investigates the questionable methods used by some journalists at the News of the World to get a story, revealing allegations of law-breaking that go beyond phone hacking, he asks whether police inaction allowed such practices to continue. Journalist Ben Laurance explores the likely effects of the Government’s spending cuts and plans for the Big Society. He reveals how private outsourcing companies such as Serco and G4S are set to take over large areas of the public sector and, based on track records, the likely effects on services.